This can be sometimes hard to detect as they do move about and can live anywhere on the hair. They are usually only found on the scalp when feeding, which they do every 3-4 hours. Otherwise, they live and move about on the hair shafts. 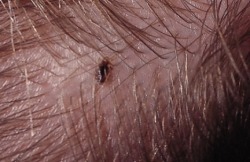 Finding live lice means an infestation is present and appropriate treatment is required. This entry was tagged Cootie Catchers, Lice, Saudi Arabia, Umm Adam, خدمة سعوديةلعلاج قمل الرأس و إزالته. Bookmark the permalink.